The tile on the tub splash is a perfect place to coordinate other tiles in the room. These tiles can coordinate with the tile on the floor, the shower, the walls or the sink splash. Whether your tub says, “Calgon, take me away” or is simple a place to take a bath, it’s usually a focal point of the bathroom, so why not make it special? Before determining the tiles and design for the sink backsplash, measure the mirror height to make sure the mirror can be mounted above the tiles where you can still see your reflection in the mirror! Take into consideration any windows that are behind the tub before planning your tile design. One of the first things to take into consideration when choosing a tile for a tub is the size. Larger tiles help make an area appear larger, but if you only have a few inches around the perimeter of the tub a large format tile will be too large. It is best to find the balance between the size of the tile and the size of the space being covered. If using tile with a whirlpool tub an access panel is necessary to keep from having to tear off the front of the tub in the event the motor needs to be accessed for repair. 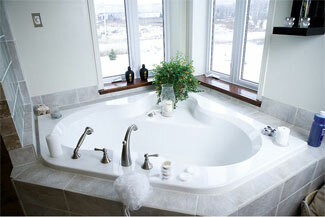 Tub splashes are not only decorative, but functional for protecting the walls from water splashing behind the tub. You only need a small amount of space tiled to protect the walls, but you have the option to be more decorative than what it necessary. Often, the tub front is made from wood, it is acceptable to have a wood front with a tile top and splash.